An ancient huge banyan tree and few neem and coconut trees were one of the beautiful things in the “Sandhai” (local farmer’s market) at my grandparents village. A number of locally grown vegetable,fruits, organic eggs and dried fishes were sold here. Even turkey,hens and cows were sold and bought during the day. Its open only on Mondays. People from neighboring villages throng in great numbers to watch the trade. There will be merry go rounds, terracotta, “colour” (cold drink),“kuchi ice” (local ice sticks) and sparrow stalls too. I have always enjoyed my visit to Sandhai with my granddad. I was really fascinated when I visited it for the first time. This episode was during my school summer break. “Thathaaaa! (Grandfather) , its getting late we need to go to Sandhai today.” I screamed as I woke up from the bed. “Get up, brush and take a shower first! Join the prayers soon and don’t overfeed the turkey today” replied my grandmom. Everyday when I wake I would run to the backyard to feed the turkey my grandmom used to raise. It would lay 1-2 eggs every other day. Due to over-excitement I would feed them every 30min and they end up sitting with a blotted stomach. So my cousins and I were always warned from giving them too much grains. After the quick shower, I wore my favorite red frock and was all set for the day. I ran to the small garden and plucked few hibiscus. As I entered the pooja room, my granddad’s serene face spared a warm smile and I entered winking at him and stretching my arms with the flowers towards him. He then placed them in the “Velli poo-koodai” (Silver flower basket) and then kept a dot of “kumkumam” (red coloured auspicious powder) on my forehead as a blessing and continued to chant the Mantra. My granddad is a handsome old man with criss-cross wrinkles running everywhere around his face. He always wears “Spadiga Malai” (beaded chain) around his neck, his arms will be smeared with chandanam (sandal wood paste) and also a triple layer of vipudhi (ash) on his forehead. I feel that this makes him look even more handsome.Every morning he would dutifully offer prayers to the Amman (Lord Devi) idol at our home and decorate the goddess with flowers and kumkumam. After the ellaborate prayer session, I became too restless and kept nagging my grandad to get ready to leave. I ate my breakfast fast and kept running behind my granddad to start early.The local market generally works from 6.00AM to 1.00PM. My grandmom repeated the list of things to buy to our maid M and also to my granddad. Even I kept contributing the stuffs my grandmom had forgotten to mention. The Sandhai is just two bus stops away from our home and it just takes 10min to reach there. As we entered the massive open space, I clutched my maid’s hand tight and kept walking with her towards the hand-fan seller, an old man with toothless mouth and wrinkles all around. He sold 2 for Rs. 10 (0.20$) and she claimed that to be very expensive and finally bargained 4 for Rs.10. (he he!). Once she finalized the deal, she spared a proud smile at me.By then, my granddad went to other part of the Sandhai to purchase sacks and ropes. As I walked across the Sandhai, I remember little boys and girls, barefoot and clad in partially torn and restitched dresses, running along the narrow path between the various stalls to the puppet show happening at the other corner. The little ones were busy nagging their parents to buy them new combs, mirror and trinkets and there will be immediate “No-No” nodding as a reply. There was an old lady screaming about the price of her vegetables with maximum enthusiasm. My maid knew her and she bought most of the vegetable from there. She got me introduced as “Yedhu! Achi ooda peethi” (meaning Achi’s granddaughter). She immediately recognized me…..rather recognized my grandmom and as always spared a huge lie “Yes, yes!! she resembles her grandmom” and smiled at me. Thats the way everyone in the village would refer you whenever somebody introduces you to be so-on-so ‘s grandchild. Thats where I saw a Palapinji (baby jack fruit) for the first time in my life and also tiny chicks painted in pink, red, yellow and orange colour. I insisted that my maid buys them and on my way back home I carried those cute chicks in a bamboo basket and a baby jackfruit with great pride. For the next day lunch, my grandmom made this yummy baby jack fruit curry and I am just in love with it since then. The post for today is Baby Jackfruit Curry. This is a simple curry prepared with onions and shredded coconuts. This is an easy to fix curry which has a mushy texture. It tastes absolutely divine with Rasam rice. The lovely aroma of dry chillies and curry leaves adds an exotic taste to this dish. Cook the cubed pieces of Baby jackfruit along with turmeric powder and salt in a cooking vessel carrying hot water. Let them cook for 15-20min or till they turn soft.Remove from flame and drain the water. Let it cool and then grind them into a coarse form in a mixer. (Look at the picture above for the coarse look). Set them aside. Heat oil in a kadai and add the mustard seeds, urad dhal, dry red chillies and curry leaves. Once they splutter, add the onion to the tempered oil. Cook in a medium heat for couple of minutes stirring occasionally. Add the cooked baby jack fruit to it and add salt to taste. Let them cook for 3-5 min. Finally add the grated coconut and give it a complete mix. Cook for further 2 mins and serve hot. I never know that we can make curry with Jackfruit…. Looks yummy….I think you can send this to AFAM-Jack fruit. Looks lovely.. Delicious recipe! I have tasted this before at my friend’s place… But i never tried making it at home. i have never tasted jack fruit b4 in any form..but looks delicious..
i totally loved ur story…especially the kuchi ice..hmm..i love the baby jackfruit curry..though its been years since ive had that..
I’ve never had jackfruit before. Have to try it one of these days. Nice photos and nice write-up. Delicious recipe and i like baby jackfruit curries. 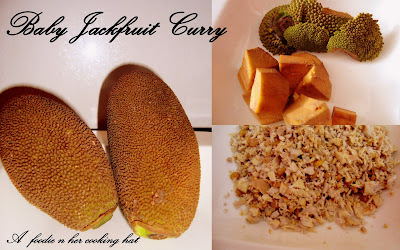 Never tried anything with baby Jackfruit..Looks yummmLovely writing..
Nice write up…enjoyed reading it…Curry with jackfruit sounds great…i have never tasted it…Thanks for sharing the recipe…Nice blog and presentation. Simply yummy write up and picture..enjoyed. Wowww superb curry, lovely also loved the story:)..
love your story… mmm i’ve missed baby jackfruit for such a long time, haven’t tasted it for ages! we love this in curry, and add some lamb meat in. how I miss my home-country now… and my late grandmother. Aaaah thats quite a storya nd neatly narrated. Love the poriyal…sounds unique. I love this, used have this everytime i visit Malay… Great.. I am really happy to invite you to participate in the contest that is getting launced on Feb 20 2009 – check out this link for details – http://justurs.blogspot.com/2009/02/magnificent-click-contest-2009.html contest. very new to me.. looks super yummy. i’ve never had it before. looks yummy. This looks lovely,i jes made this today and happened to visit ur blog too.Good one! Everytime I walk into a grocer I see this Jackfruit and always wonder what the heck would you do with that. I don’t even know how to cut it and it looks dangerous too lol. Maybe you talked me into trying it, but it still makes me nervous lol. I’ve not tasted or heard of this dish till now – how interesting. Kutchi ice brought back so many memories. I have something for u in my blog. Pls accept! It really looks lovely but never tasted or heard about jack fruit. lovely childhood memories.Tasted only sweet JF,the baby JF curry looks delish! Lovely cute story. Love the way u narrated. Its been years since i had. so new to me, looks yum. So intriguing! It looks amazing. The memories on sandhai and grandparents are lovely. Baby jackfruit curry looks yummy.